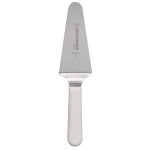 Pick up the Dexter Russell commercial pie knife for your restaurant today! This commercial pie server comes with a polypropylene handle and is 4-1/2 in. x 2-1/4 in. With this Dexter Russell pie knife, you can give your customers the perfect pie or cake slice every time, thanks to the unique design that makes this Dexter Russell pie server not only easy to use but convenient as well. 4-1/2 in. x 2-1/4 in.